Charles Ross and Son Company has announced a stocking program covering its popular line of Ribbon Blenders. The Blenders are available for sale or rental. Stocked for immediate shipment are Blenders in the following sizes: 5, 10, 18, 25, 36, 52, 120 and 150 cu.ft. working capacity. Each of the Blenders is constructed in type 304 stainless steel and is polished to a smooth 80 grit finish on the exterior and interior surfaces. 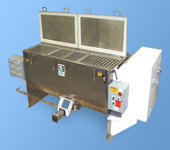 Standard manually operated slide paddle valves located in the bottom center of the trough are included. The blenders are driven by right angle reducers to accommodate bulk densities up to 40 pounds cu.ft.